This second map is a detailed one of our tour which will help me figure out where I was each day. 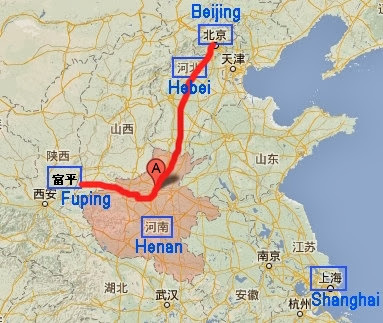 Fuping is off the map to the west and Beijing is approximately 450k north east from the top of the map from Handan. We went by fast train and it took 2 1/2 hrs to get there, wow, and it didn't even look fast from the train. I still haven't downloaded all my photos from the camera as it's been a frantic week. So for mostly my sake I will continue the blog describing my trip so that I will make sense of it. There were some wonderful experiences I want to remember by writing about them and posting corresponding photos; the Terracotta Warriors; the opera; the Longmen Grottoes; the unusual sights. It certainly was the trip of a lifetime and shared with some great people. There was a comment posted by an anonymous person on my blog, someone who bought some of my work from the exhibition and left a lovely comment. Thank you whoever you are. Markets in the morning to continue to pay for the trip, then I'll start saving for the next!!!!! Labels: China. Maps of China.